The mission of Saints Peter and Paul School is to promote a quality, Christ-centered, Catholic education in a safe, positive, loving environment. In faith, we foster dedication to wisdom, truth, and social responsibility. We promote academic excellence; challenging students to become the best versions of themselves. We believe that the purpose of Saints Peter and Paul School is to continue the message and mission of Jesus. As Catholics, we are being called to teach, serve and build a faith community which gives an authentic witness of the love that God has for each of us. We believe that Saints Peter and Paul School provides an atmosphere of Catholic values that encourages the integration of the spiritual, academic, physical, moral and social formation of each person. We believe that the parents and staff are co-educators. Each student’s growth and learning is enhanced through his/her involvement with these co-educators to be part of our lives. We believe each student shares in the responsibility for the education process by an attitude of open-mindedness. We believe that Sts. Peter and Paul School is a viable and life-giving to the parish community. Saints Peter & Paul students gain a comprehensive knowledge of the Catholic Faith and Her Traditions and practices. 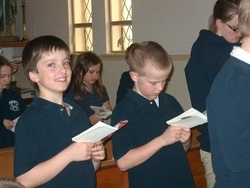 Saints Peter & Paul students actively participate in liturgy, sacraments, devotions and daily prayer. Saints Peter & Paul students are expected to be good Catholic role models who appreciate, respect, and have compassion for others. Saints Peter & Paul students participate in school and community stewardship projects. Saints Peter & Paul students are expected to make healthy choices for the physical, social, mental, and emotional well-being. Saints Peter & Paul students are expected to accept responsibility for their own learning. Saints Peter & Paul students meet or exceed academic expectations. Students attend Mass twice a week and take an active part in presenting the Mass by reading, leading the prayers of the faithful, taking up gifts and the collection, and serving. The homilies at Mass are geared toward children. Prayer is an integral part of the school day. What do we do to celebrate Catholic School's Week? In 2018, we kicked off the week with a school scavenger hunt. Tuesday we had some bowling fun at the local bowling alley. Wednesday afternoon was the Catholic Quiz bowl. Thursday we went to the theater and watched "Heaven is for Real", and on Friday we had our Alumni Lunch & Recess, and then a can castle building contest. "I appreciate the Virtue Program at Sts. Peter & Paul. My child is very motivated by it." Charity, honesty, integrity, hard work, and personal responsibility are all virtues. We have implemented a Virtue Program where one of these virtues (or one of the many others) is explained to the students each month with reminders to work on that virtue posted throughout the school. 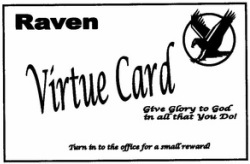 If a student is observed displaying the virtue, they are given a Virtue Card which they turn into the office for a fun-sized candy bar and their name is published in our weekly newsletter. During the Christmas Season, time is taken out of the school day to for an Advent Prayer Service and to light the candles on the Advent Wreath. "I appreciate that my entire family can name and recognize everyone/child at SPPS including teachers and facility staff ... such a family environment." ​All Saint's Day is a perfect time to teach about people who made the world a better place! We celebrate holidays!! We kick off the holiday season by celebrating the Feast Day of St. Nicholas on December 6th. St. Nicholas had a reputation for secret gift-giving, such as putting coins in the shoes of the needy who left them out for him. 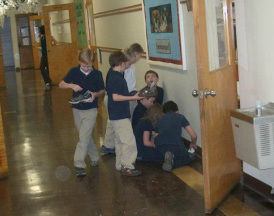 In honor of his feast day, all of the kids take off one shoe and leave them lined up in the hallway. After the students watch a video in the gym about his good works, they come back to find a little something in their shoe. 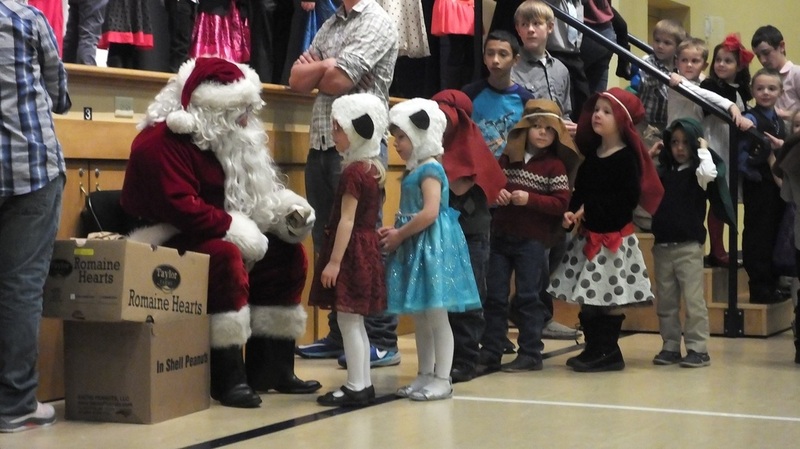 "I appreciate the fact that our kids are going to be able to celebrate Christmas at school!!" 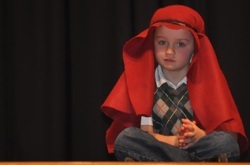 We look forward to our Christmas program where our students display their acting abilities in plays that are often quite quirky, but always have a Christian theme. At the end of the Program, the entire student body gathers to solemnly sing "Silent Night" and then the upbeat "Santa Claus is Coming to Town" when Santa joins us and hands out treats to everyone! "Oh God, I guess I would have to say that I am a lot like this man Simon. How many times could I have helped someone else. Maybe by watching my younger brother or sister; maybe by helping a classmate with her studies; maybe by offering to go to the store or help with the dishes. Help me to do more than just stand by and watch. Help me to be a doer." "I appreciate and feel blessed that my children have the opportunity to attend a school where Catholic values are not only taught -- they are practiced." Religious education classes are taught daily by a certified and knowledgeable staff. The teachers at SPPS (and all Diocese of Boise Catholic schools) are required to have a “Basic Catechist Certificate.” When a teacher is hired, he/she has 3 years to obtain the certificate. The Standards for the certificate are that the teacher must complete 40 or more clock hours in the following areas: Scripture, Theology, Sacraments, Morality and Catholic Social Teaching, Catechesis and Methods, Spirituality and Prayer. The teacher must also have one year of catechetical experience. After receiving certification, each of our teachers must complete ten additional hours of study each year to keep their certification current. All of our teachers either have this certification or are working to earn it. Our Pre-school, Kindergarten, 1st & 2nd graders are participating in the Catechesis of the Good Shephard program. Most of our students attend Youth Group when they get into high school. We felt the best person to assess the religious formation of our students is the High School Youth Group teacher. To read an essay from her, click here.